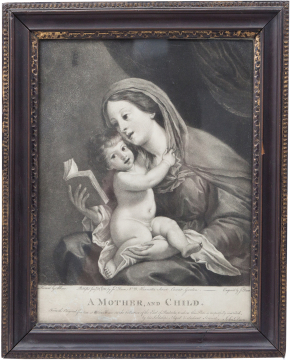 Inscription: Lettered below the image A Mother and Child / From the orignal picture at Wilton House in the collection of the Earl of Pembroke to whom this Plate is respectfully inscribed / by His Lordship's oblig'd and obed't servt John Dean and Painted by Albano. / Publish'd Jany 31st 1783, by Jno dean, No. 23, Henrietta Street, Covent Garden. / Engrav'd by Jn.o Dean. 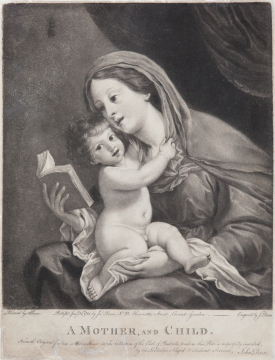 The Virgin Mary is seated, reading from a book she holds up in her right hand, with the infant Christ seated on her lap. He puts his arms around her head, grasping her veil and smiling out towards the viewer.